The stained-glass windows at St Pauls spell out visually our parish mission statement and clearly indicate that we are a welcoming faith community. Each individual window is so designed to show that all paths lead to the center window which depicts the sacrament of the Eucharist, the core of our faith. In the center window a cross is formed by the brass dividers and stained glass. The individual crosses coordinate with the shadow cross on the outside of the church building. A sunburst around the Eucharist in the center is considered the ray of life with the blood of Christ flowing out into our world. this window points to the rose window and symbolizes finding a spiritual home-a unity in diversity. The colors of blue and purple reflect warmth and compassion. This window symbolizes living water as related to the dying and rising intended by the sacrament of baptism. This window reaches toward the rose window revealing the open arms that the Risen Christ extends in welcome. The flame reflects movement and life guided by the Holy Spirit. A spirit of warmth and welcoming results from the flame. The dove is the symbol of the Holy Spirit who descends upon all members of our faith community. 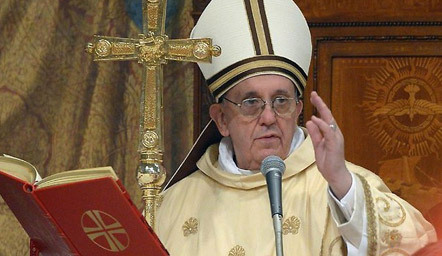 The Holy Spirit is the final gift of the Risen Jesus to the Church. The tree is the expression of all things living. The layers within the window reveal the depth and layers of human life. The color green is chosen to remind us of the springtime color of all life. The three interlocking rings symbolize the Trinity. Seven spaces within the rings symbolize the seven continents of our world and the various colors symbolize the intermingling of all the races of our world. The interlocking hands with Christ symbolizes the very nature of Church united in the sacrament of the Eucharist. The rays flowing out from the heart reveal the bond that is created and nourished in the heart of Jesus. The colors of blue and purple point to the warmth and compassion that must characterize a Christian faith community. 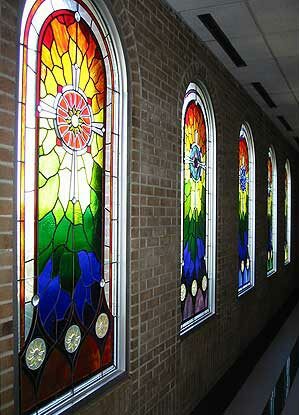 These windows characterize our faith community. We sincerely believe that the Sacraments of Baptism and Eucharist form the basis of our faith community. It is in our celebration of the Passion, Death and Resurrection of Jesus that the mission of St. Paul’s is vitalized and deepened because it is here that Jesus, the Master, draws closest to us in faith.